And here you will get exclusive 5 reels menu with 243 ways to make your luxurious order. So, just make your choice and get the most attractive benefits from a huge selection of Free Spins, various lucrative bonus features from the chief cook, delicious Multipliers for dessert and maybe even tasteful jackpot of 7,500 coins. 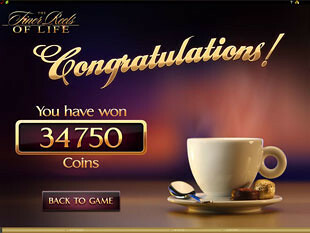 Here everything is made for life’s relaxing moments and also great winnings. And that’s why you will get joyful and inspiring wild and scatter symbols. Make your time money-making holiday whenever you want. 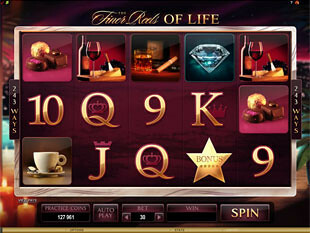 So, as a VIP visitor you will get some special offers at this elegant slots restaurant. And just try to use wisely awarded benefits. So, double your prizes catching in your winning combo the symbol of Finer Reels of Life Wild. This symbol can substitutes any other icons to increase your chances to hit a prize and also multiply the winning by 2 times. And maybe, it’s time to find out about prices of the tasteful winnings here. So, everything depends on the size of the stake you make. 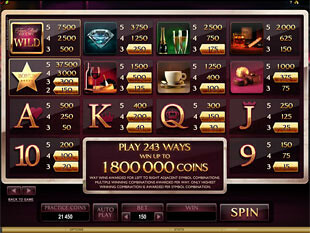 Try to taste the most delicious jackpot of 7,500 coins or $375 for betting $7.50 per one spin. And you can do that with a minimum of effort. And here is the best part. Imagine all honey reels become entire wild? Juts feel this pleasant taste of huge money prizes with Wild Celebration Feature! 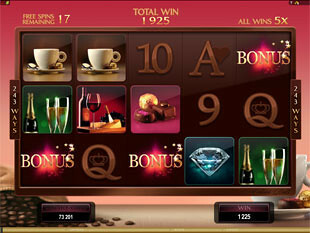 Just spin the reels of the game and get this random bonus to get more for your cash here with up to 5 wild reels. Wine&Cheese Feature. Get more from the 5th trigger of the bonus of Finer Reels of Life. 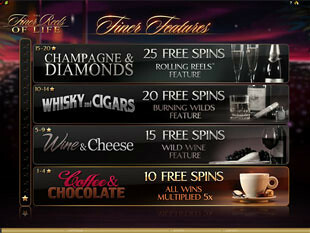 Because here you will get Wine&Cheese Feature with 15 Free Spins. Moreover, you will get unique Wild Wine Feature. So, just look for Wild Wine symbol on the reel 3 to turn symbols in additional random substitutes to hit more money prizes. 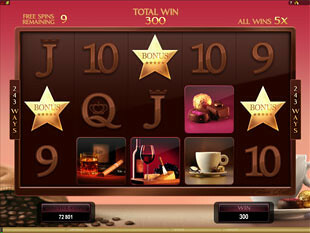 Collect 2, 3, 4 or 5 Bonus Stars during the feature and you will get 1, 2, 3 or 4 additional Free Games accordingly. Watch the reels attentively, because burning wilds can randomly turn some symbols into 2x or 3x Multipliers. Two symbols start burning? Congratulations! You have just won 6x Multiplier! Champagne&Diamonds Feature. Do you want to get some romance? You can have it after 15th trigger of the Finer Feature and activate Champagne&Diamonds Feature. Here you will get the chance to cut a melon while relaxing during 25 Free Spins with Rolling Reels Feature. Such Rolling Reels can bring you 2x, 3x, 4x or 5x Multiplier that increases with consecutive wins. Choose one of the best free spins casinos by Microgaming to visit this elegant online restaurant of The Finer Reels of Life and taste the most delicious bonuses. Spin the reels to see the whole menu of money prizes!